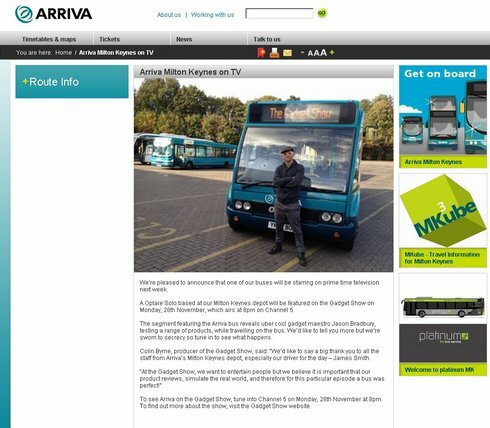 Well, If you are at home tonight, and have nothing better to do then you can spend a bit of time BusDriverJames spotting on Channel 5 at 8pm tonight during The Gadget Show. I am sure the bus will get far more coverage than me, But will be interesting to see how it’s played out compared to how it was recorded on the day! This entry was posted in Arriva The Shires, Buses, Daily Life, General, MK Metro, Photos, Plain Weird, Uncategorized, Work. Bookmark the permalink. 2 Responses to TV Tonight! Saw the feature. I didn’t see him falling all over the bus so well driven. Did he give you a free pair of headphones?